YOU ARE THE GUINEA PIG !! 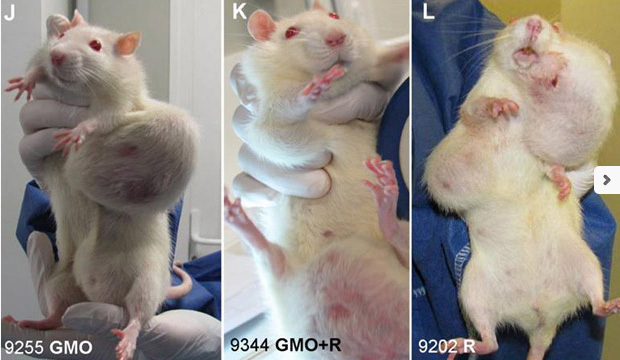 GMO CORN, MONSANTO'S "ROUND UP READY" CORN HAS BEEN PROVEN IN FRENCH RESEARCH TO CAUSE CANCER, LOTS OF IT. The research was considered so "hot" that the work was done under strict secrecy. According to a French article in Le Nouvel Observateur,2 the researchers used encrypted emails, phone conversations were banned, and they even launched a decoy study to prevent sabotage! Don' you just love Monsanto's logo? "FOOD" means they poison it. HEALTH means they destroy it on behalf of the Eugenists and Big Pharma. "HOPE" means they hope you live only long enough to make them rich.